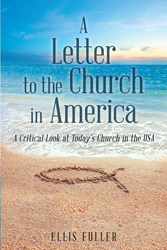 “A Letter to the Church in America” from Christian Faith Publishing author Ellis Fuller is a comprehensive study of aspects of the modern American church that are serving as impediments to the development of a thriving and growing congregation. “A Letter to the Church in America”: an in-depth contemplation of the issues facing the church in the United States. “A Letter to the Church in America” is the creation of published author Ellis Fuller, a retired computer systems analyst, former prayer counselor for Cornerstone Television (CTV) for nearly twenty years, and leadership volunteer who has served for decades in a variety of capacities in local churches. “A Letter to the Church in America” takes a critical look at the problems and obstacles facing the modern church in the USA. It also provides some solutions and alternatives to the current paths it is taking. Many denominations are losing members in significant numbers. There is a reason for this. In its attempt to attract the world into its four walls, the churches in America have become more like the world they are trying to influence. The chapters in this book attempt to identify and offer suggestions to correct this dilemma. This book is written for pastors, church leaders, and lay people alike. Although every chapter will not apply to every church, it offers an inventory that provides a comprehensive look at what is hindering their progress. Published by Christian Faith Publishing, Ellis Fuller’s new book is a critical study of the issues and obstacles facing the modern American church. View a synopsis of “A Letter to the Church in America” on YouTube. Readers can purchase “A Letter to the Church in America” at traditional brick and mortar bookstores, or online at Amazon.com, Apple iTunes store, Kobo or Barnes and Noble. For additional information or inquiries about “A Letter to the Church in America”, contact the Christian Faith Publishing media department at 866-554-0919.